A successful marketing campaign for a Wolverhampton automotive engineering company has reunited former colleagues. Rakeplan Engineering on the Hilton Trading Estate in Lanesfield was forced to lay off half its staff when it was among many automotive supply chain firms to be hit heavily by the recession. The company asked Rodger Cooper from the Manufacturing Advisory Service for help and he recommended the services of Techmark at the University of Warwick Science Park to improve its marketing and sales activity. Rakeplan received funding and help from the Manufacturing Advisory Services’ (MAS) Automotive Recovery Programme towards a telemarketing sales campaign and the printing of a calendar to promote the services of the machining company. One of those to receive the mail shot calendar was Sime Foundry in Wednesbury – and it has led to not only a new customer for Rakeplan but has brought Mark Elsey back in touch with former colleagues Mark and Ralph Kendrick. Mark, the managing director of Rakeplan, said: “We had a great deal of enquiries from the marketing campaign and in fact it has almost been too much to handle because at times we have had so many to deal with. 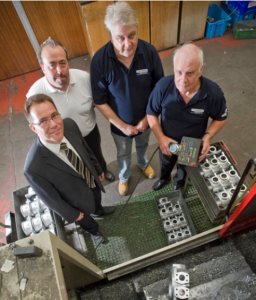 “We have definitely seen an impact from it and it has led to new business. One company, Sime Foundry, was looking for a small engineering company that didn’t mind doing small batches of goods, which we don’t at all. The upturn in business has led to the company employing two extra machine operators to cope with demand in this country and abroad. Around 60 per cent of Rakeplan’s business is exported to Holland and the Czech Republic. Dirk Schaefer, of Techmark, said they had designed, executed and implemented a cost effective marketing campaign for Rakeplan Engineering. “There are many companies just like Rakeplan in the West Midlands who need help with their marketing but very often don’t know where to start,” he said.